ACT’s shock test rig can produce a peak acceleration of Gpk=123g. The vibration capabilities include a frequency of 267 Hz, Grms=24g, and Gpk=45g. Examples of shock and vibration test profiles are shown in Figure 3. Figure 5. (a) Shock Test Table (Left). 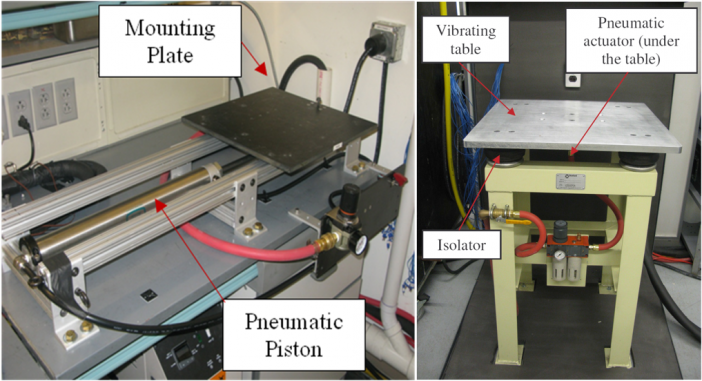 (b) Vibration Test Table (Right). Hybrid Two Phase Loop System. ACT tested a pumped two phase system with internal wick components to military vehicle shock and vibration requirements. Figure 4 (a) shows the PSD profile of the body and frame in a Future Combat Systems (FCS)-like military vehicle. The PSD curve produces a maximum vibration level of about 5 Grms. Figure 4 (b) shows the shock profile of the same vehicle with a half-sine pulse of 10 G’s for 50~75 ms. This thermal performance was identical before and after the tests. Heat Pipe Loop Assembly- This assembly was tested to the shock and vibration specifications shown in Figure 4 under full thermal loading with no degradation in performance during testing.